In 2014 and 2016 General Public (Chris Poolman & Elizabeth Rowe) were commissioned as artists-in-residence to develop work for Longbridge Light Festivals. 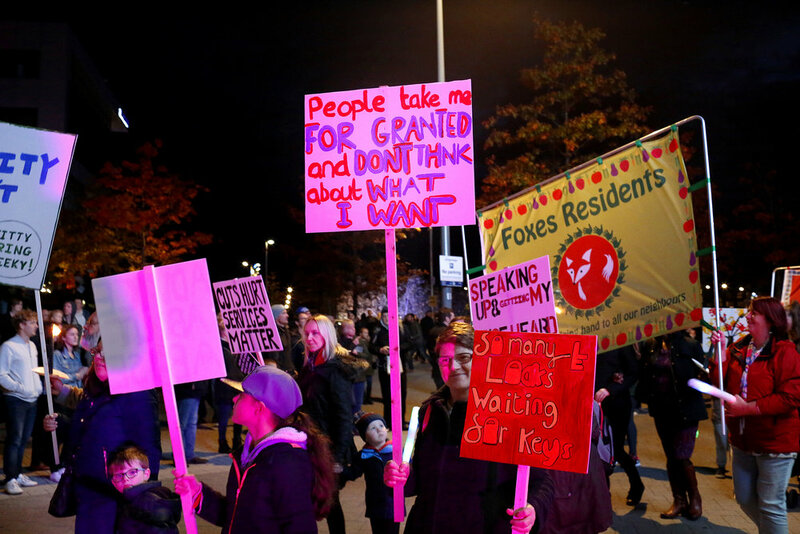 For LLF 2016 General Public brought a touch of mild 1960s idealism to the Longbridge Light Festival 2016 with their ‘very civil’ rights march. Taking its name from a Martin Luther King quote – ‘Our lives begin to end the day we become silent about things that matter’ – the parade featured local community groups and school children marching with banners and holding placards. 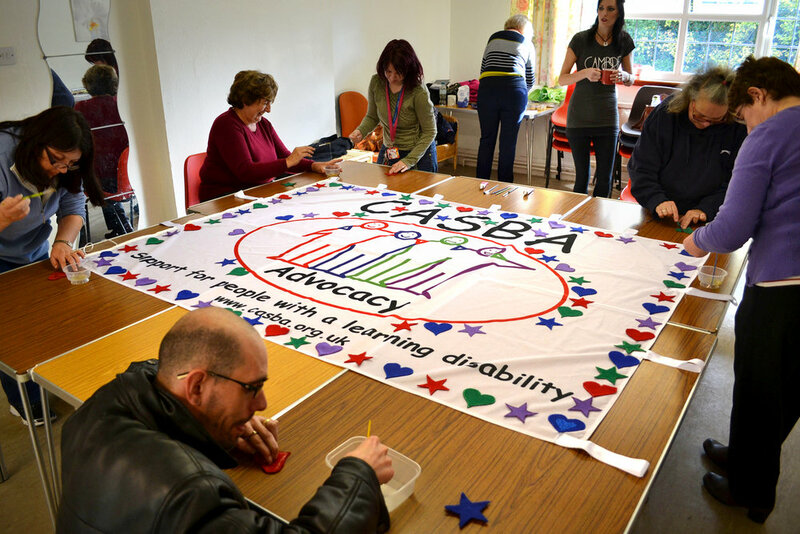 These were all made by the people taking part to tell you about what is important to them. Musical accompaniment was provided by 9 piece brass band The Young Pilgrims who performed a special ‘protest song’ musical medley. 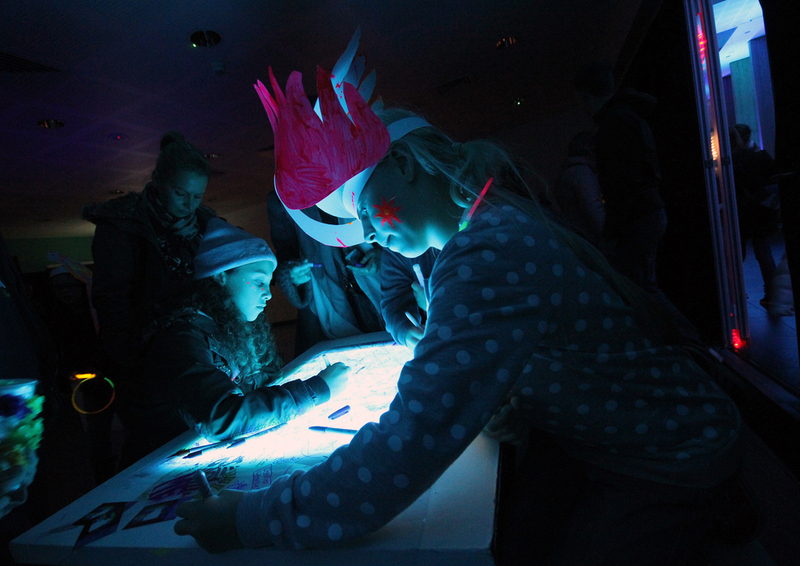 For LLF 2014 the artists were commissioned to develop the theme and curate Longbridge Light Festival 2014. Where once stood the largest car factory in the world, now stands the new Bournville College. Bringing with it new knowledge, opportunities and expectations, the college resembles a building that has landed from a science fiction future. Elsewhere in the new town centre extra-terrestrial unknowns abound, Greggs' sausage rolls for instance. Set within the new Longbridge town centre, the inaugural Longbridge Light Festival contained a combination of newly commissioned artworks, special events, LPAP artists-in-residence work in progress and an exciting participatory programme. Local businesses and community groups opened their doors to the general public as we go ‘Back to the Future’. Set within a rapidly changing mixed-use redevelopment site, itself resembling a shifting, earthy, lunar landscape, the new town centre site is strangely science fiction. Dominating this space is the new Bournville College, referred to locally as ‘the spaceship’ on account of its distinctive architecture. Matthew J Watkins and Poolman Rowe will present 'Close Encounters of the Longbridge Kind' as they use coloured light and images from local archives to transform the college into an extraordinary other worldly object. In Austin Park, a series of cave sculptures by artist duo Juneau Projects contain animations that offer messages about possible near-future scenarios, whilst Austin Houldsworth’s interactive light sculpture creates a dramatic central hub within the new town centre to measure community cohesion. In this town centre of the future, The Institute for Boundary Interactions replace the old town crier with a digital manifestation, absorbing and exclaiming social media at random. While the starting point for Joanne Masding’s LED video wall commission, ‘Symbol for a Light’, is the anglerfish, an animal which uses a dangling, luminescent organ on its head to attract prey and mates - a symbol and metaphor for the seductiveness of new technology perhaps? In contrast, Matthew J Watkins exploration of homemade science fiction effects introduces a more retro technology into the ‘smart city’ space via a series of obsolete overhead projectors. Flatpack Festival's ‘Magic Lantern’ show in the Bournville Conference Centre injects a further level of historical technology as Mike and Theresa Simkin delight us all with the marvels of Victorian entertainment. How do we imagine the future of our town centres? The new Longbridge town centre raises a number of questions in relation to the ecology of the city, the politics of regeneration, sustainable living, mobility and energy usage. But in looking to the future, we are in some ways looking to the past – the ‘Back to the Future’ of our subtitle. 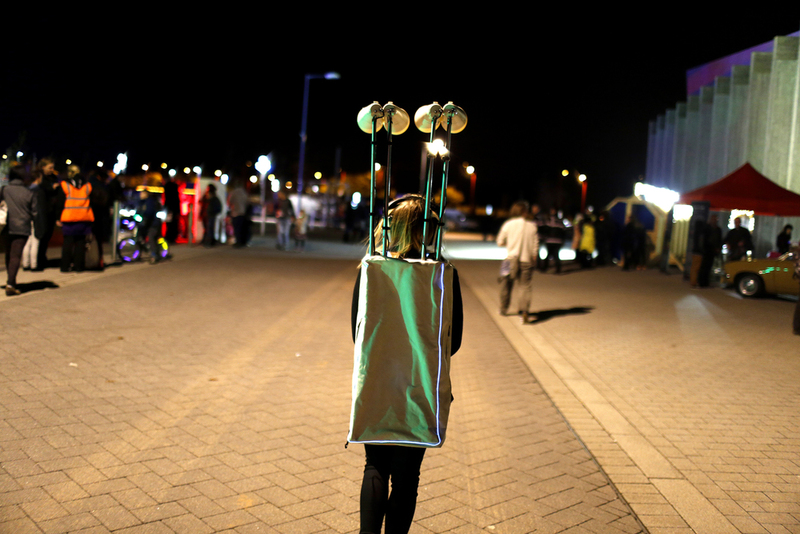 Older methods of negotiating the city, cycling for example, are becoming increasingly popular and the Longbridge Light Festival presents a number of commissions and special events that respond to issues of sustainability within the new town centre. The 'Illuminated Science Fiction' cycle route invites people to dress up, light up and travel along the River Rea Valley route to Longbridge, temporarily illuminated between Northfield and Longbridge on the Saturday evening of the light festival. Within the context of the Birmingham Mobility Action plan, it asks how a permanently lit-up Rea Valley route - from city centre to city edge - might improve our negotiation of a car-centric city? BAZ’s collaboration with students from Turves Green Girls School, sees them constructing a tube carriage from a future fictitious ‘Birmiwoco’ transport network based on the Austin Allegro’s Quartic Steering Wheel. This will be powered by the open source ‘litre of light’ eco technology pioneered as a solution to the lack of electricity in the slums of the Philippines. Other alternative uses of light in the town centre include Pitaya’s 0% energy installations, inspired by the red weed in HG Wells' 'War of the Worlds', which ‘grow’ on street lights along the new High Street and the specially commissioned sculptures in the lantern parade. Built by artist Ruth Claxton, these are coated in retro-reflective paint (activated by light), a substance that is currently being incorporated into eco-focused European urban design. Daan Roosegaarde, who is speaking at the International Conference as part of the Longbridge Light Festival, is a pioneer in this field. As a wider proposition, the Back to the Future theme captures the difficulty that many areas undertaking a process of regeneration face: the need to look to the future, whilst celebrating a past that is vital to the identity of the local community. The artists involved in this project address the complex political and social context of Longbridge’s past in a variety of ways. Stuart Whipps conducts an ‘auto-psy’ as he projects forensic-like images of Mini parts in one of the factory’s former tunnels under the Bristol Road, whilst Cathy Wade’s ‘Found Sculptures of Longbridge’ use light to transform local redundant architecture - the three red tanks - into illuminated markers of industry. Designer Heavy Object presents a process of ‘ghost-mapping’ or layering of historical information onto the festival map that is then played out by lighting up former entrances of the car factory on to the current town centre. Using car parts as her conduit, Aillie Rutherford will conduct a series of psychic experiments in both Greenlands Social Club and the new town centre that will ask local people to imagine the future of Longbridge. Anna Schimkat, Moritz Wehrmann and Famed, all artists from Leipzig (a twin city of Birmingham), address the social context of Longbridge, perhaps framed by their home city, which like Birmingham has an industrial heritage on a colossal scale. Morton Underwood’s sound recordings make links to a further city of industry - Detroit - with their light activated feedback machines. Longbridge itself exists on the periphery of the city - literally the ‘outer-space’ of Birmingham. The festival, very much like the wider LPAP programme, involves taking art directly into a given community, rather than a city-centre centric approach that assumes we will all travel to experience culture. This is about culture on your doorstep. As such, opportunities for local involvement, community participation and long-term partnership building are essential to the festival and wider LPAP programme. Students from Turves Green girls school are constructing ‘lanterns’ and taking part in the lantern parade, whilst local community groups are invited to inject creativity into the new town centre through the ‘Window Display Competition’. Co-ordinated by cultural planner Jenny Peevers, local businesses will partner a community group and support them in making a window display in response to the Back to the Future festival theme. Likewise, local groups will make the illuminations for the Rea Valley Route transforming it for the night into a cycle path from the future. The festival presents a series of exciting opportunities for direct, hands-on participation during the event itself. 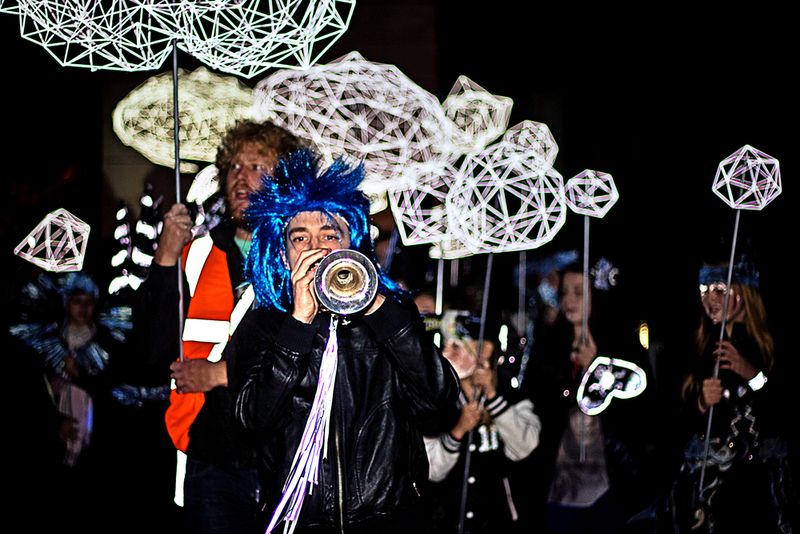 You are invited to pin the creation of the artwork in Unit Thirteen’s Light & Sound Playground, or have some fun at the making workshops in Bournville College where you can build, create, make and take part in the light festival as a walking, talking art work. Create a costume and walk around Longbridge as an alien for the night! The Longbridge Light Festival is planned as an annual event. It is for the local community of Longbridge, to bring people to Longbridge and to explore it’s fascinating history whilst looking towards the future. In conjunction with the wider festival programme, it involves local businesses, old and new, opening their doors and making Longbridge a destination. Located on the edge of the city, why not make a visit to the ‘outer-space’ festival? General Public devise daring and humourous propositions that invite communities to participate in re-imagining their local areas. Their work sits somewhere between contemporary art, cultural geography and research. For the last two years, they have been working on the Balsall Heath Biennale, a self-imitated project in their local area of Balsall Heath, Birmingham.